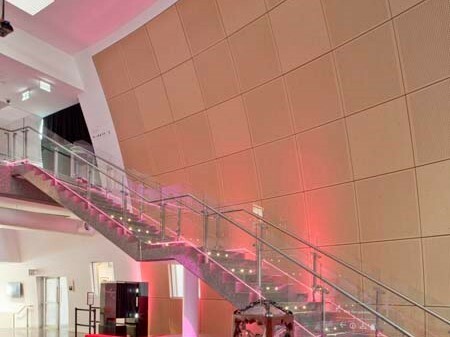 NBRS + Partners have had great success in effectively refurbishing and extending the Murray Art Museum Albury (MAMA) in NSW, the interior of which has been enhanced with a unique use of SUPAWOOD panels. Located in the heart of Albury, the project consisted of the refurbishment of two heritage-listed buildings and the addition of a new two-storey exhibition space. Maintaining heritage sensitivity as well as incorporating sustainable principles was imperative in the client’s brief. The final design incorporates a double storey wall in the foyer, which curves in both directions, a feature that presented the challenge of sourcing a timber lining which could be manipulated to follow the compound curve. SUPACOUSTIC and SUPALINE concept timber veneer panelling was ideal as these products could be fabricated with the ability to be twisted and achieve this. This also included green options, noise reverberation and superior aesthetic appeal. This sweeping twisted wall in the foyer is a prominent feature when entering the new extension of the gallery. The twist of the wall is based on a segment of a sphere, which curves from top to bottom as well as from left to right. Lining this compound curve has been achieved by customising the fixing system and then curving the panels where required. The smoothness of the curve has been made possible by using smaller and thinner panels. Perforated SUPACOUSTIC acoustic panels have mainly been used but by mixing in the occasional smooth SUPALINE panel, a decorative chequered pattern has been achieved. The acoustic panels help to address noise reverberation in this high open space and the warm SUPAFINISH Fusion Maple finish adds a welcoming ambience. The Art Gallery has now been extended from 832m² to 2036m² to make it one of NSW’s largest regional multipurpose exhibition spaces. It now incorporates a gallery shop, café and terrace with new galleries plus learning and back-of-house facilities. On ceilings throughout many of these other areas perforated SUPACOUSTIC acoustic panels have also been installed to address noise reverberation and add aesthetics. SUPACOLOUR White panels break up the expanse of the ceiling in the Gallery Shop and increase reflective light into the space. On the shop walls SUPAFINISH Fusion Maple panels add interest between the shop displays. Noise echo in the wide-open space of the Café has been dulled by installing a ceiling in SUPAFINISH Spotted Gum. This application optically lowers the ceiling height, adds the warmth of timber to the interior and blends with other fittings. All panelling used has been supplied with a fire retardant MDF substrate to address stringent BCA fire-hazard regulations. The MDF used has a low formaldehyde emission plus the finishes used are low VOC. All these features address the sustainable principles required by the client to successfully help make this project green-friendly.